Up until the release of Breath of the Wild, all video games with the coveted The Legend of Zelda at the beginning of their title had something else in common besides those first four words. It is a word the developers don’t get to choose, but, rather, you do: your name. Although Breath of the Wild does not allow Link to be named anything else in-game, past Zelda titles are tied to this name-changing tradition. Starting with the first The Legend of Zelda (1986) to Twilight Princess HD (2016), each game grants you the ability to give yourself a name. For some this may be the first time you are in control of your own name, your very identity, and no one but you gets to choose how you are addressed or who you are within the world of Hyrule, Termina, Skyloft, or wherever Link is located. 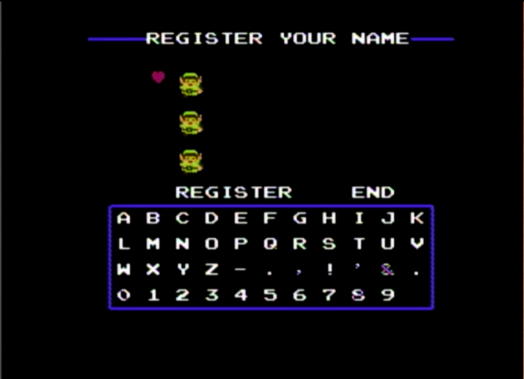 The most important step in starting on your quest is registering your name as Link, or your preferred name when given the choice. The ability to name your character can be applied to most modern video games, but Zelda was one of the first to make the name more than three characters and also stand for substantially more than a high score in an arcade. Your name stands for your time spent saving progress, inching towards the end. This name could be unique or the default “Link.” To argue on the side of not changing Link’s name to something unique, the change breaks the flow of the game if you are greeted by a villager as anything besides Link. On the other hand, using a name that makes you laugh when you see it pop up in dialogue has its merits. Neither choice is right or wrong; exercising free will is what matters most. The Legend of Zelda immerses you in its world with the feeling of choice. It is only a feeling because, at the end of the day, there are walls we can hit and limits within any game. But the feeling of choice erases those walls from your mind and allows you to suspend disbelief while controlling Link and his steeds. We register our names for Link in 1986 and for our wild horses in 2017. Choice, freedom, control; these words are embodied within The Legend of Zelda franchise and I can’t wait to uncover how many levels of choice they create in Breath of the Wild. After all, we already know you can register names for wild horses you tame and bring to board at a stable. We register our names for Link in 1986 and for our wild horses in 2017. Although what we name has changed, why we name things is a whole other matter. What’s in a name? Identity. A sense of self. Singularity. And to quote Shakespeare: “What’s in a name? that which we call a rose / By any other name would smell as sweet” (Romeo and Juliet 2.2.45–46). Romeo and Juliet may be discussing the struggle with family names, but the question “What’s in a name?” is a sense of decision, decisive deciding. Daresay, a name is a definition. Now the definition of name is a term used for identification, yet all a name does is label a thing so there is common ground for referencing said thing. 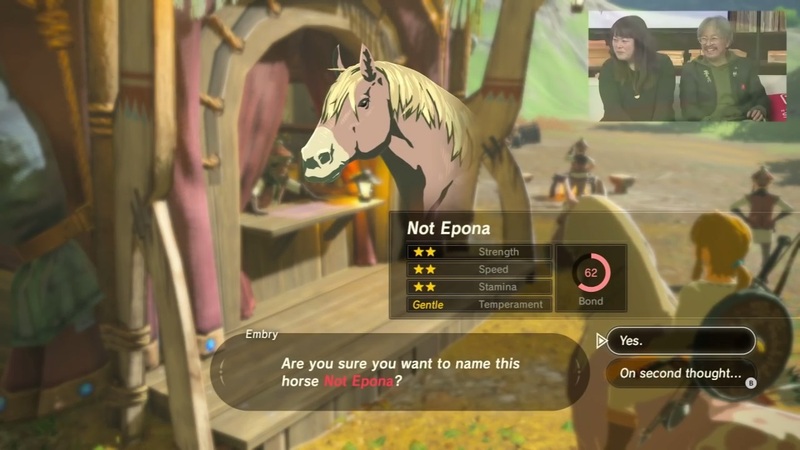 Therefore naming your — now tame — wild horse in Breath of the Wild allows the horse to be easily recognized by you, the name-giver. Names symbolize the thing they aim to represent. What’s in a name? Identity. A sense of self. Singularity. Names symbolize the thing they aim to represent. For example, let’s take the word rose as Shakespeare used it. “By any other name would smell as sweet” informs us that it is not the word rose that encapsulates the physical thing but our collective understanding of what the word rose symbolizes. As long as there is consistency in the use of a word, there is the ability to correlate a word to the thing that physically exists in the tangible world. Therefore, when names were first applied, a rose could have easily been called a fliff and no one would bat an eye. But since most nouns have been named, the time to coin new names is long gone, that is, unless you play video games with the ability to name your character. As great as it is to choose Link’s or a horse’s name, it is not the name that holds weight; what the name means to you matters most. To quote the poet Gertrude Stein, “A rose is a rose is a rose” (“Sacred Emily” 317). This sentence deserves context for those who want a complete understanding, but, for the sake of this writing, I am leaving it ambiguous as we have already traveled quite far down the rabbit hole of literary references to describe what’s in a name. When a word is defined by the same word, the laws of identity reveal themselves as flawed. The word rose and the physical rose within this sentence expresses the fact that simply using the name of a thing already invokes the imagery and emotions associated with it. Now let’s step away from the literature and back towards video games. Zelda is synonymous with The Legend of Zelda because of the repeated historical use of the name within the game franchise. Yet any name would have sufficed since at one point the choice was unchosen. If it started as “The Legend of Gilly,” it may have been just as successful. Or not. It’s up to you to like the name, and while most names are likable not all are memorable. What’s in a name? Power. Monster: Names are too powerful to share. Learn the rules: If someone knows your name, they have control over you. You: But it’s just a name. Monster: It’s not just a name. It’s you, it’s what you are. It’s all of you. A name is what you summon with. A name is why the hex has devoured the seas, the land, life. It devoured you until you were part of the junk, and now here you are like a curious puppet. This brief dialogue starts with a simple question, explores existential concepts, and ends with violence. When the monster replies, “Names are too powerful to share,” they remain anonymous and retain the only power they have left, their identity. We can feel the decrepit monster’s anguish with their next line — “If someone knows your name they have control over you” — and interpret these words as the result of past experiences for this decaying creature. The characters left in that world have become sentient…been living there for a long time…communicate by hurting each other (it’s the “rule” inside the RPG they live in), and have destroyed a lot of the available space by messing around with the code (which they think of as magic called “hex”). The game data is corrupted which is visually portrayed with deteriorating pixel-art. By playing the game you are consequentially destroying their world. With that in mind the monster’s next line weighs heavy: “It’s not just a name. It’s you, it’s what you are. It’s all of you.” In three sentences this sentient monster describes this formula: name = you. This belief is all the corroded monster cares about as it lives out its last moments. 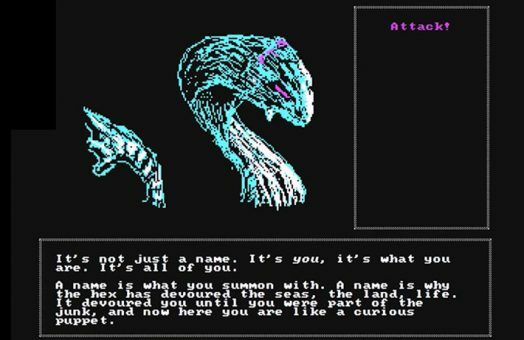 The last word the monster uses to describe you is “puppet” and is the closest to a name we get for ourselves before we attack. Link is just as much a puppet as the character we play in Forgotten since they are both figures who take form in the digital world for us and act on our commands. Before Breath of the Wild the very first action towards Link in the series was naming him. And when you start up preceding Zelda games, it will start with the choice to register your name. In the end a name is a name. I'm short and sweet, like this bio. @AlyssaParmenter (almost) everywhere.